I love these slides! What better way to use sarcasm and show that students should be taught to unleash creativity instead of holding it in! Curriculum should be somewhat related to students, instead teachers have to go by curriculum. I believe just giving a bit more effort many teachers can combine creativity, curriculum and free will by planning! Very inspirational post! Frisbee lovers. we must unite to defend ourselves from this grievous attack on our honor and relevancy! Glad you dug these, Pal! And no joke: You were my inspiration. The slides you’ve been sharing for years made me want to do the same. For that, I owe you one. Not only are my presentations better, but the creative side of slide creation is something I really enjoy. Thanks, Bill. Teach your kids how to make them too and then share them with us! 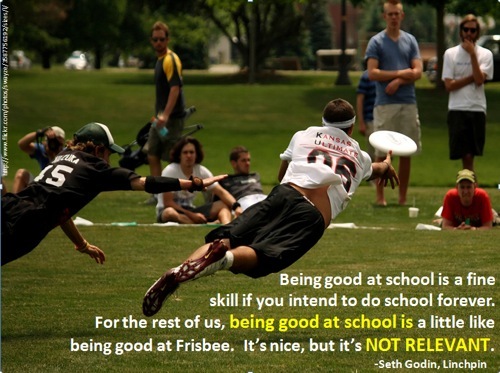 I think we need to re-define school so that it is not like frisbee. We have made school a place where students who can sit for long periods of time and absorb information then at a later date “find” the right answer on a multiple choice test the captains of the team. I think it is the desire of most teachers to actually give students the skills to be successful in the real world. 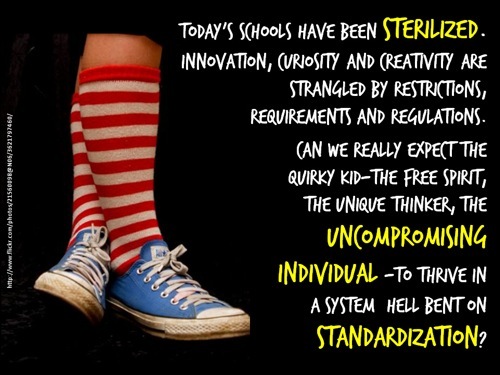 If only our government would stop creating superfluous hoops for kids and teachers to get through, and allow us to develop curriculum that inspires and challenges kids to think creatively, then maybe school won’t be a game. These slides are just great! Each one is very unique and uses sarcasm well. Education should be more than just test and lecturing. I believe it should be preparing our student on what the real world is like and how having an education will help them get further in life. Thank you for sharing! I appreciate the point of these slides and that they have valid relevance. On the other hand, I think that many schools have made substantial changes in the way they interact with learning and to make broad generalizations about schools and education that imply that they are useless or harming is de-energizing for those of us who are working on it and lacks clarity for those who need to be working on it. I also do not agree with several of the statements. I find that there is a lot of room in my classroom for the quirky kids who share their quirky ideas and are actively involved. The challenge is the quirkiness that is in reaction to life and expressed as apathy, disruption for the sake of disruption, and lack of kindness to self and others. That is the place we need to work on and is often much larger than schools. But as far as the infographic is concerned, I love kids wearing quirky shoes and socks! Although I have great respect for Seth Godin. I do not completely agree with this statement (at least out of context), there are many parts of school that are similar to life and being good at them is useful. That said, I also think that being good at frisbee is a useful thing, so I may jest be on a different wave length. 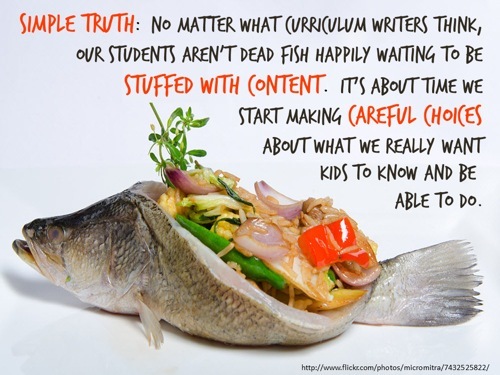 As far as the fish goes, there is a ton of energy, time, and resources constantly being put into what content schools should be focused on from individuals who know and care, not just large corporations and dictators. I have not yet seen a time when any version of “careful choices” has been met with contentment by all. I do understand the impetus for these slides but I find them uninspiring, as I spend enormous amounts of time and care creating a learning environment for students. The other option to constant criticism of schools is to consider that perhaps schools are in general not a good structure, the idea of pulling groups of generally same age individuals into cultivated environments to impart anyone’s “careful choices” is perhaps never going to work for the experience that many feel education should be. We certainly can not quote any good ole days in education, but many feel that the good ole days before mass education offers a wiser choice, remaining with the family and working for its success. And yet even then those good ole days were only for some and modern life has changed for that vision, as there are few families who can afford to be farmers and many craftsmen professions are now industrialized. So yes, these slides speak to some truths in education but I feel that they do not have a constructive purpose besides giving those frustrated with school a moment of empathy, perhaps that is value enough?